Some Brownsville shoppers were lined up at H-E-B on Paredes Line Road before it opened Thursday, only to leave with empty bags. They had their eyes on the grocery chain’s reusable bags featuring an iconic image of Tejano superstar Selena Quintanilla. 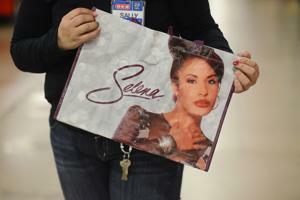 The bags went on sale at 6 a.m. in stores and online at selena.heb.com. The $1.99 bags are limited to two per customer, and online orders have a $7 shipping charge. Julia Lozano was among the shoppers who started their day early to start collecting the bags. She was the first person in line at 5:40 a.m. at the Central Boulevard H-E-B, though she noted people who arrived before her were waiting in their cars. A friend alerted her to a short line at the Paredes Line location, where Lozano went to purchase four more before heading to the H-E-B on Boca Chica Boulevard. She ended the early morning shopping, eight commemorative bags in hand, by having breakfast with a friend who was similarly visiting Brownsville H-E-B locations. The first-edition Selena bag sold out within 30 minutes at some H-E-B locations when it was released in March, but inventory has compensated for that this time, a spokesperson told the Brownsville Herald. Lozano has been a Selena fan since the singer began her career in the 1980s. One of her daughters even had a choreographed dance to the 1994 hit “Techno Cumbia” during her quinceañera. As part of its partnership with the Quintanilla family, H-E-B will donate $25,000 to The Selena Foundation, a non-profit organization committed to community and educational initiatives, according to a news release. The Selena Foundation will dedicate funds from this donation to the Boys & Girls Club of the Coastal Bend.